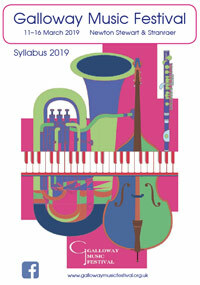 The syllabus has been chosen by a group of local musicians and includes classes for a wide variety of skills. Our name, the Galloway Music Festival, illustrates the main area from which entries are received. We greatly value the continued commitment of the Local Education Department and our other contributors. Each year the committee needs to seek substantial funding from sponsorship or grants to cover the cost of the Festival, as our aim is to continue improving the status of the Festival and to encourage more participants. Members of the public are most welcome to attend all events during the festival, both daytime and evening sessions; admission to all events except the Festival Concert is FREE. This year the Festival Concert will be held in the Cinema, Newton Stewart, on Saturday 16th March 2019 at 2pm. Tickets are £5. Admission for school children of any age and all performers is free. Galloway Music Festival Safeguarding Policy for children and members of other vulnerable groups.